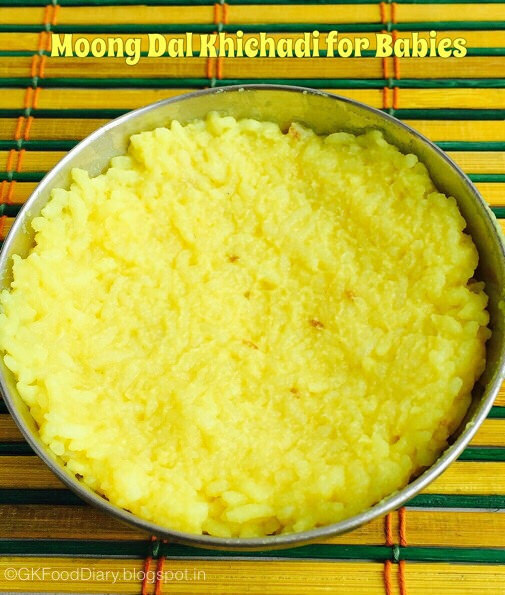 Nutrition rich lunch recipe for babies with Moong dal and rice. Wash the rice and moong dal well in running water. Then soak them together for 30 minutes at least. Then add required amount of water, ghee, garlic, cuming seeds, hing, turmeric powder and salt in a small pressure cooker. Mix well. Close the lid and pressure cook it in low flame as possible for 6-8 whistles. Open the cooker once the pressure released. Mash the khichadi well with your hands or with a masher and feed your baby warm.